President Trump isn’t known for following the traditional political playbook. So, it was slightly surprising to see him spending Tax Day talking about … well … taxes. 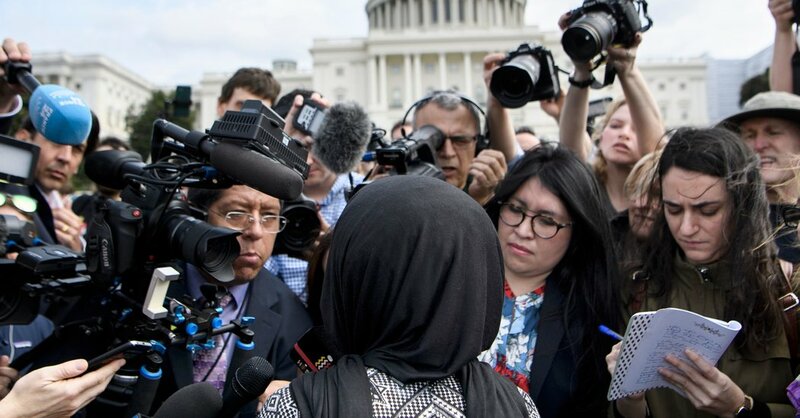 But while Mr. Trump’s words may have stayed on message, his political sights were aimed elsewhere: Representative Ilhan Omar, one of the first Muslim women elected to Congress. That Mr. Trump held his tax event less than 20 miles outside Ms. Omar’s district in Minnesota, a state that narrowly went for Hillary Clinton in 2016, was no accident. Nor were his recent attacks on Ms. Omar, a former state representative who has spent a little more than 27 months in any kind of elected office. Mr. Trump’s appearance today in Minnesota, an early salvo in his re-election campaign, highlights a fundamental question he faces as we head into the 2020 race: Will his base be enough this time? Rallying conservatives used to revolve around a three-word slogan — “God, guns and gays” — which served as a shorthand for the type of cultural issues that sent voters streaming to the polls. Mr. Trump has a long history of incendiary comments against Muslims. (This 2017 timeline from The Washington Post details nearly a decade of his statements.) He opened his campaign calling Mexican immigrants “rapists” and, since then, has repeatedly cast immigrants as criminals and drug dealers. And from sexual harassment to N.F.L. protests, he has intensified hot-button issues of race and gender by throwing fiery comments into our national debates. Some of these stances can be attributed to the president’s personal beliefs and temperament. But there’s also a calculated political strategy at play. It’s worth taking a look at some numbers from the 2016 exit polls. When Pennsylvania voters were asked whether minorities are favored in the United States, 31 percent of the electorate — or around 1.9 million voters — agreed. Of those, 1.6 million supported Mr. Trump. Pennsylvania, as many of you may remember, went for Mr. Trump by less than 45,000 votes. We don’t know how many of those 1.6 million voters flipped to Mr. Trump. What we know is the belief that white people are under attack — which exit polls showed was shared by Trump supporters in Wisconsin and Michigan — has helped animate his support. That brings us back to Ms. Omar, a woman at the intersection of all three elements of the new culture war. A refugee from Somalia, she’s a hijab-wearing Muslim and is closely identified with the Democratic Party’s left wing. Her comments last month before the Council on American-Islamic Relations led Mr. Trump to post an inflammatory video implying she trivialized the horror of the Sept. 11 terror attacks. She has also divided members of her own party, having made several statements that repeated historically anti-Semitic tropes. Their responses to Mr. Trump’s video, cataloged here by my colleague Astead Herndon, ranged from fierce to more milquetoast. Regardless of the complicated politics surrounding Ms. Omar, though, the freshman congresswoman has a decent shot at re-election. Her Minneapolis district hasn’t voted for a Republican in nearly six decades, and her profile will make it fairly easy for her to raise the kind of money that scares off primary challenges. The bigger political unknown is whether this benefits Mr. Trump quite as much as he may expect. Today is the day we’ve been waiting for: Federal Election Commission campaign finance reports are due. The public will finally get to see the full picture of something that’s been leaking in bits and pieces — how much each candidate raised during the first three months of the already-crowded 2020 race. Typically, happy campaigns file early. That’s why we received Mayor Pete Buttigieg’s information early this morning and President Trump’s last night. These reports include all kinds of data beyond just how much each candidate raised. We can see what they spent on, how many people they’ve hired and how much is left in the bank. It’s a fascinating peek into each campaign that gives an early sense of their operations. Money isn’t everything, as Mr. West points out. Hillary Clinton raised nearly double what Mr. Trump did in 2016. But in politics, it certainly does help. • The top fund-raisers in the first quarter of the year were Mr. Trump, whose campaign raised $30.3 million, and Senator Bernie Sanders, who raised $18.2 million. • Mr. Buttigieg raised $7.1 million in the quarter, and spent modestly, ending the period with $6.4 million in cash on hand.